UNHCR Across Croatia, modest housewarming parties are taking place, as refugees from the conflict in the 1990s get decent and affordable accommodation, thanks to the Regional Housing Programme (RHP). Many of these refugees have struggled for years since the fighting ended. One Bosnian woman, now 75, who lost relatives at Srebrenica, spent 22 years in the limbo of refugee centers. Another Bosnian woman, who was 16 when she fled to Croatia, has only now got her own flat at the age of 42. Single mother Rusmira Osmic was recently allocated a bright, modern flat in the capital Zagreb. “We couldn’t wait to move in, stay the night and wake up here. It has been such a long road for us,” she says. In Croatia, the state buys flats, using funds provided through the RHP and lets them to former refugees at symbolic rents. It has been supported over a number of years by international donors — in Croatia, in first place by the U.S., which is the second-biggest donor of the RHP, after the EU. Under the same programme, where possible, refugee houses have been reconstructed. Between October 2014 and December 2018, 253 families (601 people) received RHP assistance in Croatia. 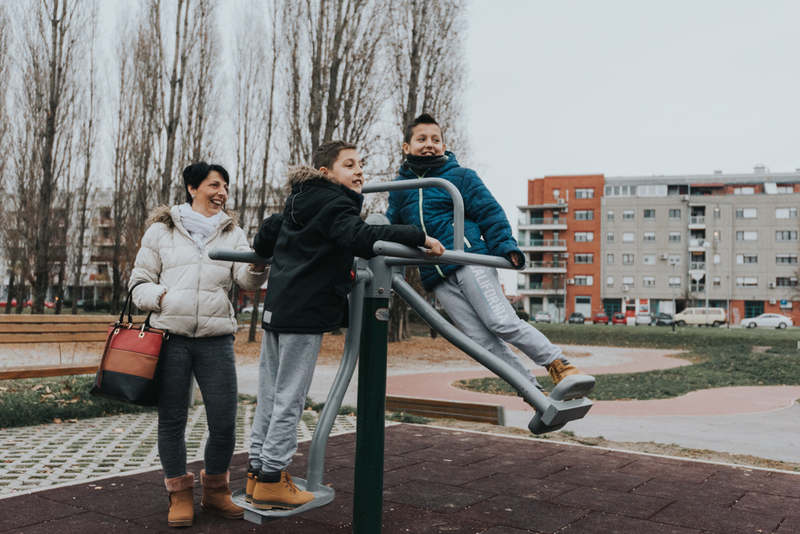 Based on the current pledges of international donors, the RHP will, by 2021, provide a durable housing solution for a total of 411 families in Croatia. They will receive housing and the chance to rebuild their lives in more dignified conditions. RHP aims to complement the efforts of the Croatian government in providing durable and sustainable solutions to the most vulnerable returnees and refugees. In Croatia, as well as in three other RHP partner countries – Bosnia and Herzegovina, Montenegro and Serbia – UNHCR has been helping the authorities to identify the neediest beneficiaries and to ensure the offered housing solutions are genuinely sustainable, including access to basic rights and services, such as health, social welfare and education. The problem dates back to the 1990s, when war caused chaos in countries that emerged from the dissolution of the former Yugoslavia. Four years of conflict in Croatia (1991-1995) led to the forced displacement of more than 500,000 people within the country. During the conflict, some 250,000 ethnic Serbs from Croatia sought refuge in neighboring countries. Overall, Croatia has provided or rebuilt some 170,000 homes to people who have returned since the conflict ended in 1995. Croatia also gave temporary protection to some 400,000 refugees from Bosnia and Herzegovina when the war was raging there from 1992-95. Rusmira fled from Bosnia and Herzegovina in 1992. Her three children were born in Zagreb. Her life has been a terrible struggle, briefly in a refugee center and then in sub-standard private rental properties. Her low paid jobs, cleaning and market-trading, barely paid the bills. At last, life is taking a happier turn. Rusmira now has a staff job in a company canteen. For her new subsidized flat, she will pay a smaller rent to the state than she did in the private sector, thus saving more of her income for the children. 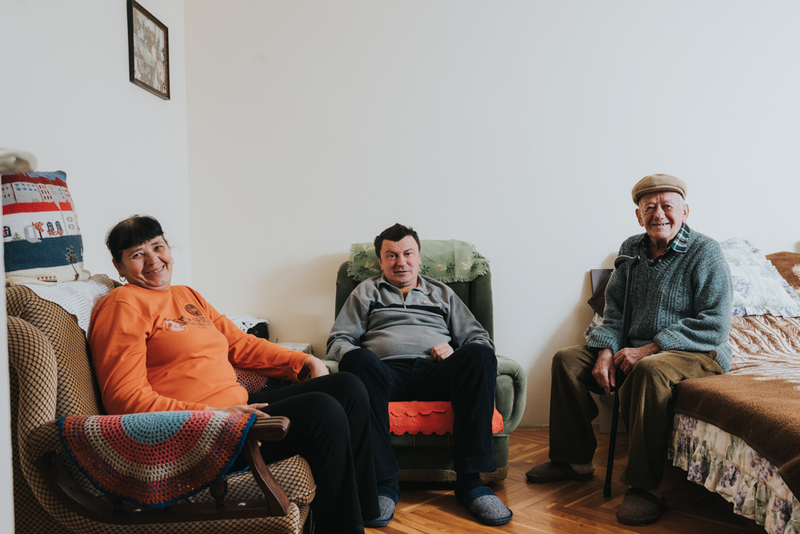 Meanwhile in the town of Glina in central Croatia, Milan and Ljubica Martinović are enjoying the light and warmth of a new flat after years of living in a dilapidated wooden house. Milan, 50, and Ljuba, 57, are ethnic Serbs, who fled to Serbia during the war but came home to Croatia, where they were born and feel they belong. They went to Serbia with their first families and met and married after they returned to Croatia. It was late flowering love but housing conditions for the returnees were less than romantic. Milan, a former metal worker, took his new wife to the old wooden house of his childhood in the village of Mali Gradac. Ljuba brought her elderly father Milan Borović, now 85, to live with them. In Milan’s absence, the house had been looted. “I didn’t find a single spoon when I returned,” he says. The weather had also rotted the wooden structure and there was no electricity or running water. UNHCR helped the family with legal paperwork and recently they got a new apartment through the national housing scheme. Now Ljuba embroiders in comfort, Milan reads on the couch and Ljuba’s father rests in his own bedroom, an icon of St. George looking down from the wall. 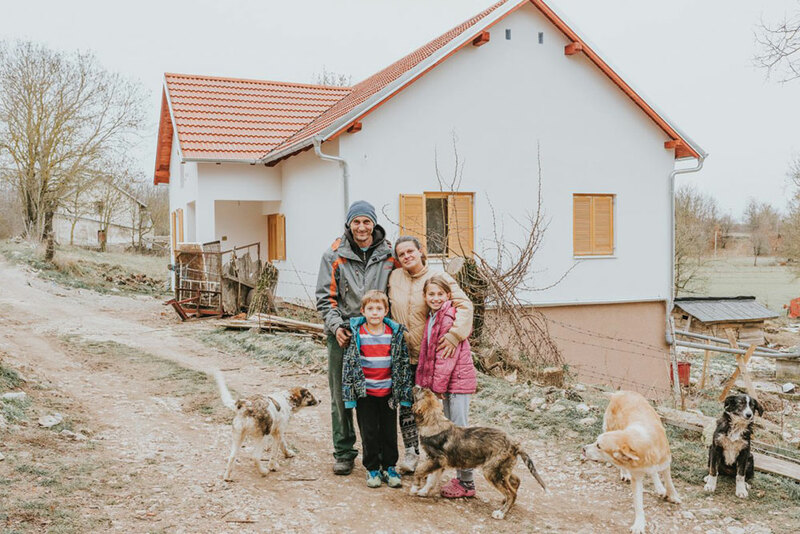 Another ethnic Serb who has returned to his roots in Croatia is Boro Matić, 44, reviving the farm where he grew up in the wilds of the Velebit Mountains. During the war, whilst he was away in Serbia, the house was burnt down in an arson attack. Boro and his Bosnian wife Sabina, 33, got the farm going again with some animals but until recently were unable to live there. Instead, they rented a small flat nearby. While Boro worked at a sawmill and their two children went to school, Sabina dedicated a few hours to the farm. Now they can look forward to full-time farming, as their family home was finally reconstructed, thanks to RHP. The family moved in at the end of 2018. In 2015, Croatia also housed former Bosnian refugee Ćamila Hadžović, 75, who had spent 22 years in collective centers. 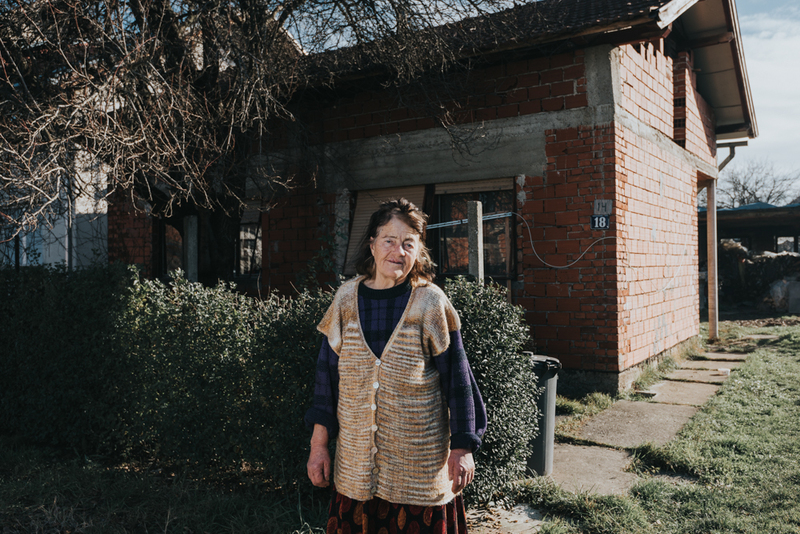 Now a widow, she has been given a low-rent house in the town of Petrinja, where she can enjoy a peaceful old age with her six cats. Ćamila ended up alone, living in one refugee centre after another. The house at Petrinja was offered through RHP after the last collective center closed in 2014.